The Library is currently in the process of uploading digitized versions of the Rochester High School Yearbooks (from 1947 to 2017) to our website. Each “book” on the bookshelf below is a separate yearbook; the yearbooks are arranged in chronological order (staring with the 1947 yearbook in the top left corner of the bookshelf). See the “How-To” section at the bottom of this page for information on how to use the yearbooks. Please contact the Library if you have any questions or comments. 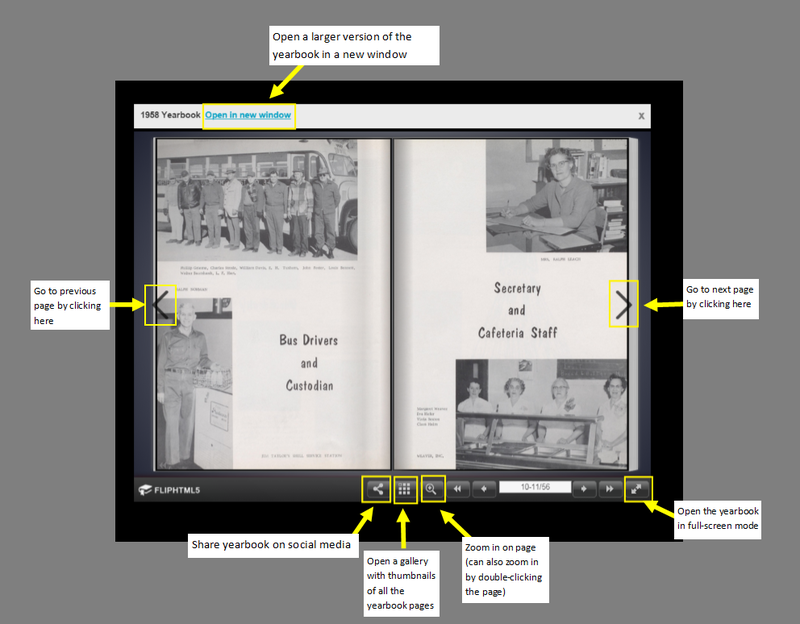 How do I use the basic features of the digital yearbooks? To open a particular yearbook, click on its cover on the bookshelf. This will open up the yearbook screen. The image below is a guide to the basic features of each digital yearbook and what they do. The features are the same for each yearbook. To get a closer look at a yearbook page, you can either click the “zoom-in” icon (the magnifying glass at the bottom of the yearbook screen) or you can double-click on the page. After a few seconds, the website will zoom in on the page, and you can click on the page and drag it to moved around the zoomed-in page. The Library uses an application called FlipHTML5 to generate our yearbook flipbooks. Because the flipbooks are hosted on FlipHTML5’s servers, and the bookshelf is automatically generated by FlipHTML5, there may be times when the yearbooks are slow to load or are unable to be viewed due to a high amount of visitor traffic. Coming back to view the yearbooks later on will generally solve the issue. If the problem persists, please contact the Library for help.